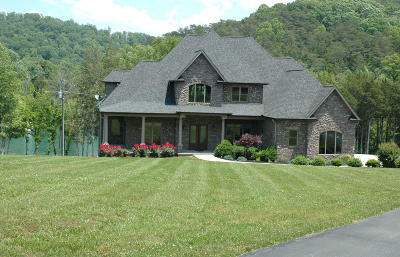 Stunning custom built lakefront home on Norris Lake. Covered boat dock with lift. Also boat launch . Incredible quality 2 story /basement home has 10' walls main level, 8' walls upstairs, 11' poured concrete walls in bsmt. Pella windows, walnut floors, MBR main level, 3 BR's upstairs, 2 additional guest rms lower level. Wonderful lake view from covered concrete decks off kitchen & master BR; Trex deck off LR and keeping room . 3 car side entry garage main level and additional garage lower level with extra storage for boat, wave runnner, etc.. Large additional fam rm lower level with patio off back. En-suite bathrooms off 5 bedrooms. Large luxury bath off master bedroom with lrg walk in closet, his & hers vanities, jetted tub,seated walk in shower with double rain shower feature. .